With the release of Droid Scan 6.3, one unified version of Droid Scan now runs on all versions of Android from 10 (Gingerbread) to 25 (Nougat). Join the Support and Beta Test community on Google+. 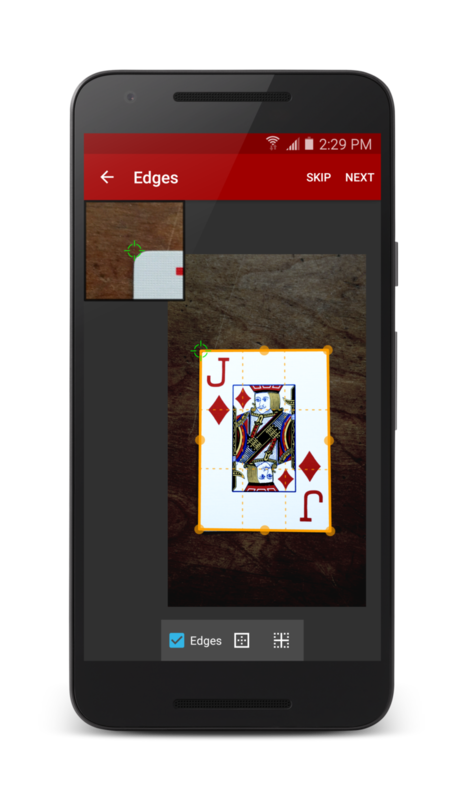 After you capture images with the camera, Droid Scan automatically detects the edges of documents, corrects perspective, contrast, and exposure, and generates a PDF file. You may adjust the automatic results as much or as little as you like. Droid Scan works great on business cards, white boards, receipts, and full-page documents. It can share scans with a wide variety of third party apps, web services, and cloud storage providers. Droid Scan can produce small scans suitable for a quick note to yourself or a friend. With a change to the settings, it can also produce ultra high quality scans with the same level of detail as the original photos. High quality scans are suitable for upload and optical character recognition with Google Docs / Google Drive (included), and in other applications that require OCR. Writing a review? Get the Press Kit.